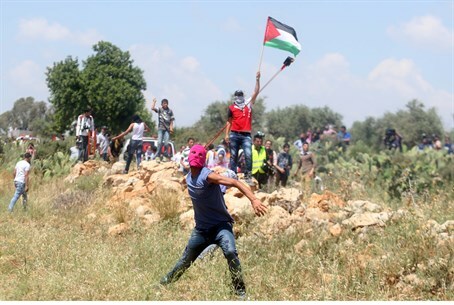 Violent riots from 'Nakba Day' on Friday continued into Saturday, as rioters attempt to storm IDF post near Shechem. Clashes between Israeli troops and Paestinian Arab rioters protesters Saturday in Samaria wounded five people, including two photographers, Palestinian sources said. The clashes broke out near an army post just south of the city of Shechem (Nablus), where 200 Palestinians had gathered to mark 67 years since the establishment of the State of Israel, which they refer to and "Al Nakba", or "The Catastrophe." Israeli troops fired rubber bullets and tear gas grenades as rock-throwing rioters attempted to storm their post Palestinian Authority (PA) security sources said. An IDF spokeswoman said at least 100 Palestinian Arabs took part in a "violent protest" during which they "threw stones and petrol bombs at the soldiers, and set tires on fire." She said two rioters were slightly wounded when Israeli troops responded with "riot dispersal means". Palestinian medics gave a toll of five wounded: three rioters as well as freelance photographer Samantha Comizzoli of Italy and a Palestinian Arab colleague who works for the Chinese news agency Xinhua. Palestinian Arabs on Friday officially marked the "Nakba" to lament the failed attempted by Arab armies and local Arab paramilitaries to destroy the nascent State of Israel after its declaration in 1948, reestablishing Jewish sovereignty in the region after nearly two millennia of foreign occupation.